A gorgeous day - a gorgeous river - a great turn-out with both many Anacostia first-timers AND 14 parkrun first-timers -but wait - there's more! We had not one, but TWO 100th parkrun milestones! CONGRATULATIONS to Ted Poulos and Anacostia parkrun founder Darrel Stanaford who both joined our 67th race for their 100th - Woo Hoo! 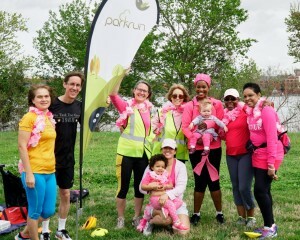 Anacostia parkrun hit our own milestone of 59 runners and walkers, and that's NOT counting all of the wonderful little ones who joined us in parkstrollers including two week old Miss Ada who came with Anacostia regular Tona and her husband - she completed her first 5K and was working very hard lifting her head in Daddy's arms to see what she had just done! A SPECIAL sing-out to participants of the Breast Cancer support Making Strides who joined us as part of their ongoing "staying fit" walking workouts - please keep parkrun on your walking calendar. Today's event ended with all enjoying the yummy assortment of celebration baked goods brought by Darrel & Svetlana Stanaford - Thank You for initiating Anacostia parkrun ! Overcast - a sprinkling rain, not too warm until JUST when we're about to start when the rain stops and the sun comes out! We welcomed 7 1st timers - and celebrated 4 PB's - Andrew's occasional stroller pushing training is paying off! 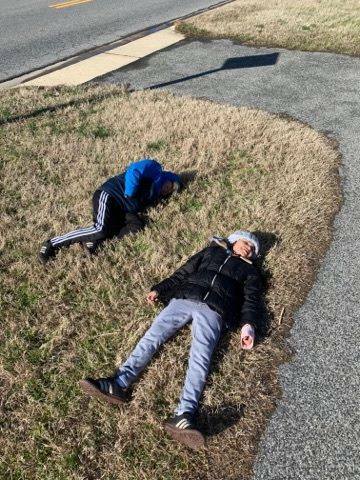 We look forward to continuing the growth of our parkwalkers and look forward to swelling those ranks next week when Making Strides comes to visit. 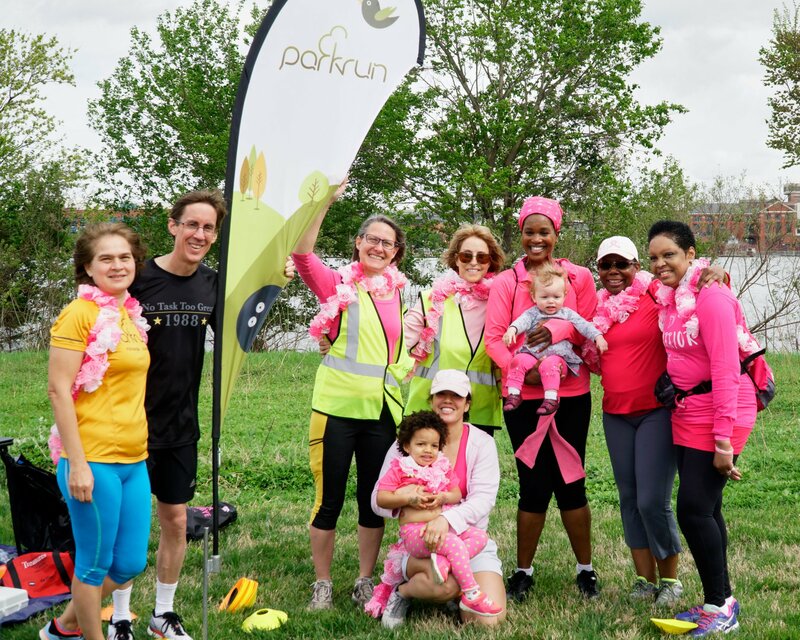 THANK YOU to the 8 or 10 prkrun participants who stayed and participated in the Anacostia Clean-Up Day - what an impact many hands can have in a short period of time! Special Thanks to Chris McBride's making sure that trash bags were available (and THANK YOU for the water too!) and his daughter Mary's help let us use the "Funnel Manager" Volunteer Job option! Thanks VERY Much to all the Day of Volunteers - and always asking is Welcome. It's also helpful for planning if you can sign-up beforehand through the Volunteer Link. One time every few weeks makes a difference! 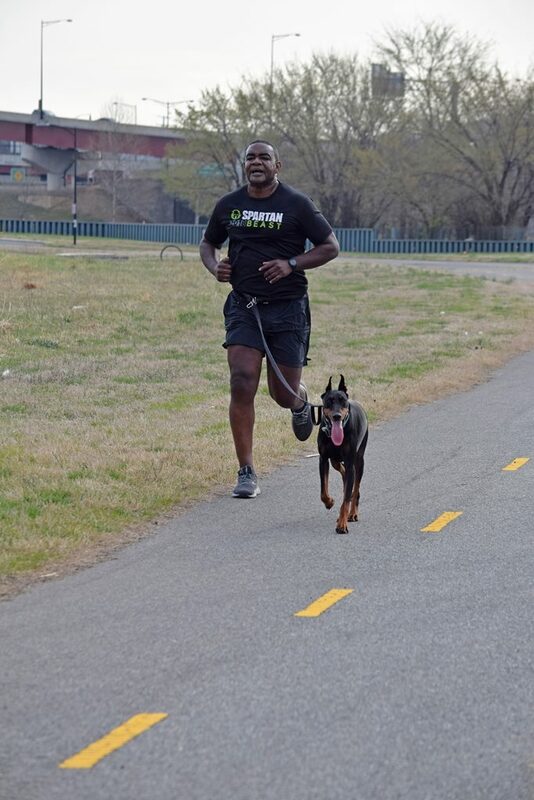 Come ENJOY a BEAUTIFUL River Front next week at parkrun Anacostia! 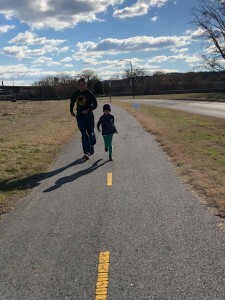 We caught a break from the cold at parkrun #64! 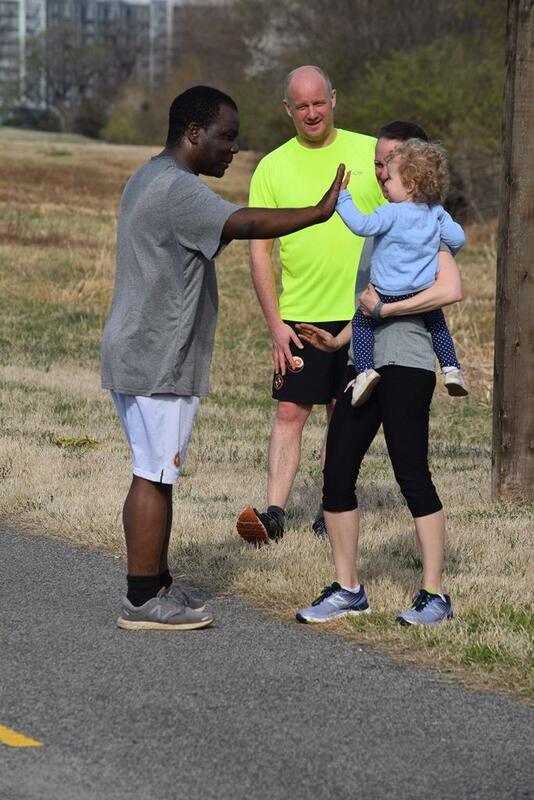 The beautiful spring weather brought out 42 runners, walkers, and joggers, including 7 first timers and 2 tourists from the UK! 8 people recorded new Personal Bests! Congrats to Lajune, Angelique, Mary, Dawn, Matthew, Christopher, Derek, and Kevin! We were especially grateful to two new volunteers: Anna, our photographer, and Stefani, who passed out finish tokens while her daughter Faith ran for the first time. We’re looking forward to seeing more newcomers this spring! The Good News is that the National Park Service is working to keep the banks of the Mighty Anacostia clear of the buildup of logs and debris deposited after a few winter high water peaks. The bad news was that they began work today just moments before the parkrun start - blocking part of our course! With flexibility and fast action parkrun was not to be deterred - parkrun Marshal Sarah Morgan directed runners on a slight course detour and a good time was had by all: On a sunny, day with a chilly breeze 19 participants joined today's event with new parkrunners, a visitor from England, a new walker on our inaugural "Promote parkun Walking" initiative, and two Under 10 First Timers who ran with their Mom - Great JOB! It was a cold, windy day at parkrun #62, but that didn’t stop us! 22 people ran, walked or jogged along the might Anacostia. 4 people joined us for the first time, including 2 brand new to parkrun and a tourist from South Africa. 6 people recorded their personal bests, including Maddox from the JM10 age group! Congrats also to Sarah, Elliott, Susan, Crystal, and Ty! Betsy went above and beyond as run director when she ran along the river to chase after our materials that had been blown away by the wind. We look forward to dedicating our next event to our walkers! Stay tuned for more details.